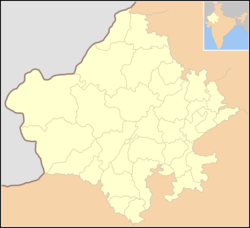 Jaipur i/ˈdʒaɪpʊər/ is the caipital an lairgest ceety o the Indie state o Rajasthan in Northren Indie. It wis foondit on 18 November 1727 by Maharaja Sawai Jai Singh II, the ruler o Amber, efter whom the ceety haes been named. The ceety the day haes a population o 3.1 million. Jaipur is kent as the Pink Ceety o Indie. The ceety is unuisual amang pre-modren Indie ceeties in the regularity o its streets, an the diveesion o the city intae sax sectors bi broad streets 34 m (111 ft) wide. The urban quarters are further dividit bi networks o griddit streets. Five quarters wrap aroond the east, sooth, an wast sides o a central palace quarter, wi a saxt quarter immediately tae the east. The Palace quarter encloses the Hawa Mahal palace complex, formal gairdens, an a smaa loch. Nahargarh Fort, which wis the residence o the Keeng Sawai Jai Singh II, crouns the hill in the northwast corner o the auld ceety. The observatory, Jantar Mantar, is ane o the Warld Heritage Steids. 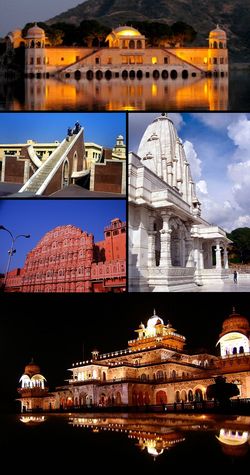 Includit on the Golden Triangle tourist circuit, alang wi Delhi an Agra, Jaipur is an extremely popular tourist destination in Rajasthan an Indie. ↑ "The Jantar Mantar, Jaipur – UNESCO World Heritage Centre". Whc.unesco.org. 31 July 2010. Retrieved 1 September 2010. This page wis last eeditit on 11 Mairch 2018, at 08:05.